Clinic Synopsis: This clinic focuses on the musical and technical challenges an oboist or English hornist regularly encounters. Educators will gain an understanding of the problems their students face and learn to edit or rewrite parts to make them more idiomatic. The clinic will also provide composers and arrangers with tools to make informed scoring decisions for both instruments. Clinician Biographical Information Musician 1st Class Joshua Arvizu, raised in DeRidder, La., joined the Navy Band in November 2009. He received a Bachelor of Music from Northwestern State University, a Master of Music from the University of North Texas. Arvizu’s primary teachers include Tony Smith, Charles Veazey, Rebecca Henderson and Igor Leschishin. Additionally, he has studied oboe and English horn with Russ De Luna, Lora Schaefer-Berndt and David Mathews. Arvizu has performed regularly with the Sherman Symphony, the Shreveport Symphony Orchestra, the Rapides Symphony Orchestra, and the Monroe Symphony Orchestra. He has taught at Tarrant County Community College and was the oboe teaching assistant at the University of North Texas from 2002 -2004. 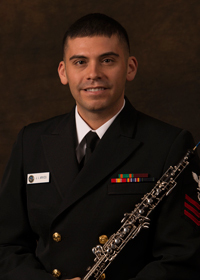 Petty Officer Arvizu has also maintained a private oboe studio since 2002.